How To Use Google Search Console To Increase Organic Traffic? Why the data from Google Search Console is so valuable? Google Search Console (also known as Google Webmaster Tools) is the fundamental SEO tool. This is the interface which site owners use to commucite with Google Search Engine. Console has many useful functions. It helps to notife the engine about new pages, structure data, monitor website errors etc. We sure that the most useful function is an opportunity to monitor ranked keywords and impressions, clicks, positions, CTR by specific queries. 1. On the first stage, we use Google Keywords Planner, Google Search Trends and Kparser to create the most comperehensive list of keywords and content ideas. All these collected keywords are the phrases by which pages might be ranked. It’s our plan. 2. On the second stage, our goal is to get feedback from search engines. Our pages are published. And Google Search Console shows how much our plan is executed. How to use search analytics data the most convenient way? We guess that the most users analyze search analytics data directly in Google Webmaster Tools. This approach has own pros. Console interface has great filters to find any information. But it hasn’t opportunity to edit collected result. So, we recommend you try Search Analytics for Sheetes Add On. It helps to work with all data from Console in Google Sheets. You can see on the screenshot how simple and easy to use is sidebar of Add On. 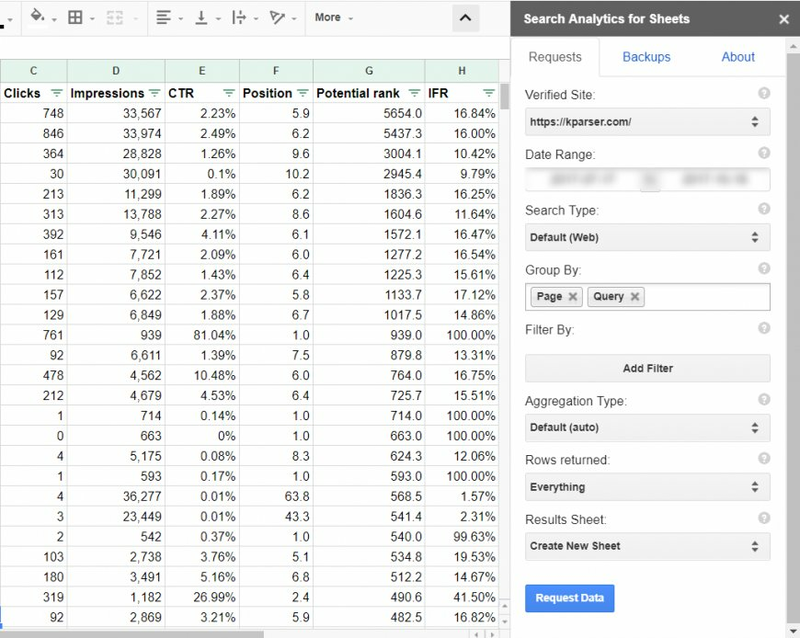 Working with search analytics in Google Sheets gives an opportunity to make own calculations and combine data in pivot tables. Pay attention to two indexes which we add to collected data. 1. Potential rank. It is an index calculated as Number of Impressions divided on the Average Position. The highest index is, the more traffic keyword can bring in the near future. 2. Ideal Final Result (IFR). It is an index calculated as Potential Rank divided on the Number of Impressions. Our purpose is to get 100% on this index. 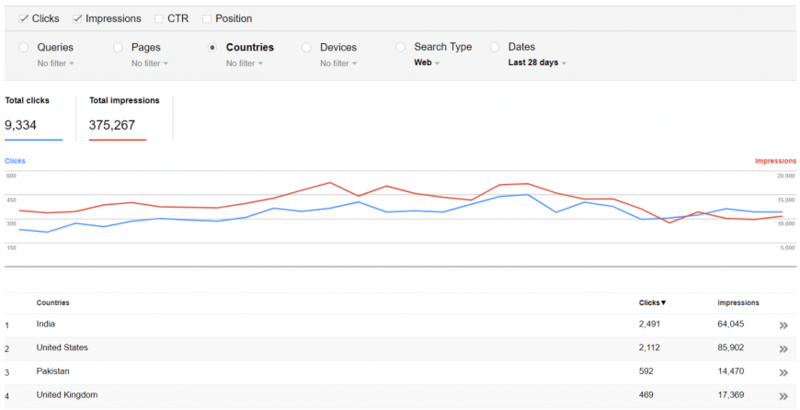 What questions does the search analytics answer? What pages bring the most of organic traffic? Which keywords bring the most of organic traffic? Which pages and keywords have the highest potential to grow? What pages might be updated to grow CTR? How much traffic can specific keywords bring for the website yet? When you have hundreds of pages, you might do the choice very often. The choice what page to update or add, which keywords to use in the titles and content etc. The best way to grow own efficiency is to use one algorithm for makeing a choice. We guess, that the best algorithm is to use terms from the theory of evolution. You create different pages by category, content, level of the competition etc. How to combine data from Google Search Console and Kparser to get more organic traffic? Use collected keyword suggestions as content ideas for creating new pages.